This straight forward layout shows how A can be added to or subtracted from register S by linking two similar circuits. 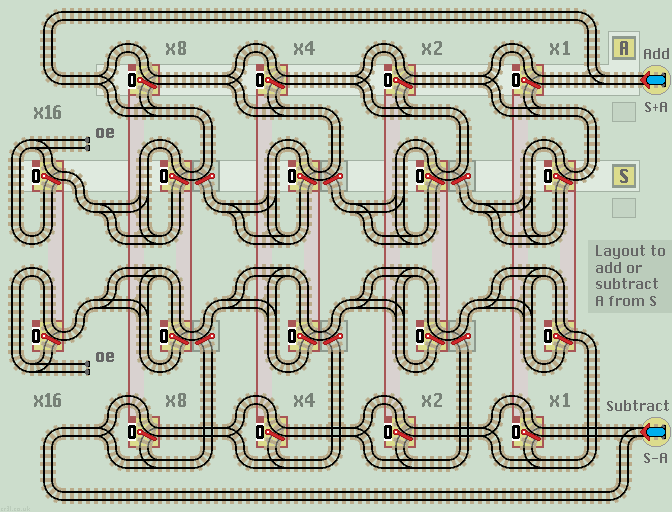 The upper circuit is an adder and the lower acts as a subtractor. If the value of S drops below 0 or rises above 31 then it is out of range and the train returns on a combined underflow/overflow error line. Enter the values of A (and S if necessary). Start the train from the correct input line depending on whether you want to add or subtract A from S. When the train halts, the result can be read from register S.
If A is set to 1, then the circuit acts as a Count Up (increment) or a Count Down (decrement) function.